Key West is a classic tourist destination, with a history stretching back to January of 1912 when the first passenger train rolled into town on Henry Flagler’s amazing Overseas Railway. Called “the eighth wonder of the world” by some for its long passages over open blue water, the Overseas Railway ended its runs from Homestead down the 128-mile long island chain to Key West when the 1935 Labor Day Hurricane destroyed it. But the charm and beauty of Key West kept the tourists coming, and despite the chain of decades and waves of visitors that have passed over the island since Flagler’s day, the city still offers some must-see gems that most visitors will never know about. 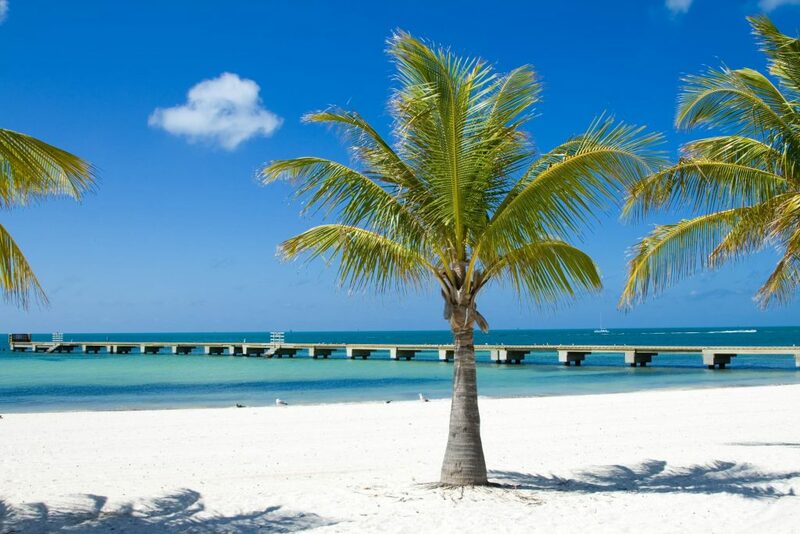 Check out this local’s list of 10 things you should not miss when you are in Key West. Smathers is a long, narrow, palm-lined beach that lies along the Atlantic side of the island near the airport and next to south Roosevelt Boulevard/State Road A1A. One of the best of the Key West public beaches, Smathers features convenient accessibility, plentiful parking, and a sidewalk that is perfect for biking running right along the beach. It’s a great place to cruise along while enjoying a great view out to sea. Smathers Beach offers generous sunbathing space on a half-mile length of white sand and is a definite all-day destination for active beach goers or families with kids because of the wide variety of activities happening there. Sailing, kayaking, windsurfing, and parasailing are all popular on Smathers Beach, jet ski rentals are available, and a beach concession stand with a good selection of sports and beach equipment is close at hand. One of the best features at Smathers is the free beachside parking just a few steps from the water. Take a gas golf cart and make it a two-beach day, because after a few hours at Smathers, it is a snap to throw the family, cooler, and lawn chairs in the cart and head west to Higgs Beach to check out the White Street pier and other attractions. OK, this one is not exactly unknown, but it is certainly a Key West bucket-list item, very conveniently located, and free. Historic Mallory Square has been a hub of activity in Key West since pirates 200 years ago anchored off what would later become Key West Harbor. The Square offers a wide-open view of the famed Key West sunset, and time has changed nothing about the dramatic color and light show put on when the sun dips into the western sea. If recommendations from the likes of John Audubon, Mark Twain, Tennessee Williams, and Ernest Hemingway are anything to go by, you will want to check it out. Nowadays, the Mallory Square Sunset Celebration draws thousands to the historic waterfront for what used to be an ad hoc hippie happening and is now an island institution that features artists, clowns, fishermen, food vendors, jugglers, musicians, psychics, tourists, and friends who gather to celebrate nature’s finale to another day in paradise. Do as the locals do and go by bike or scooter to get into the festive, free spirit of the Sunset Celebration and save time and trouble with the limited parking, or make Sunset on the Square the memorable last stop on a golf cart day tour up the island from the Southernmost Point. It is easy to find the best beach in Key West, the local’s favorite known simply as Fort Zach. Just head down Duval or cruise south along Front Street from Mallory Square until you hit Southard Street then turn right. Southard runs into Fort Street and there is no way you can miss some of the largest open spaces in the city and the imposing historical structure set against a backdrop of green trees and blue water. This beach-goer’s treasure on the tip of the island features a generous stretch of white sand, nicely-sheltered swimming water along the shoreline, and easy access to deeper waters for adventurous snorkelers. A unique aspect of this beach is the presence of the main shipping channel offshore. Between the channel currents and the land’s end location, the water here is nearly always clean and clear. A snack bar, beach rentals, nature trails, bike paths – Fort Zach has it all, and that is without even mentioning the historic site and museum. Locals hit this beach by bike, and cyclists get a special welcome with a dedicated park entry lane and plenty of bike racks. With 54 acres of park to explore, you need a bike or scooter to be able to zip around for a while without having to worry about losing your beach parking spot. As an added bonus, the nimble transportation makes it easy to explore the narrow streets of nearby Bahama Village when it is time to leave the beach in the evening and find some dinner. One thing you have to see in Key West is seafood. Most visitors do not catch on to the secrets of the Key West raw bar happy hour, but if you want to try a variety of the freshest seafood without paying fine-dining prices, go by some of the Duval Street watering holes around 4:00 pm. Cruise the street on your bike and stop in the joints to look for iced displays of succulent crustaceans, fish, and shellfish. Order a drink at happy hour prices and enjoy half-price raw bar choices like raw oysters or clams, cold shrimp cocktail, stone crab claws, sashimi, and the day’s fresh catch cooked to your order. For land lubbers, great traditional bar foods like burgers and fries, barbecue ribs, spicy wings, and other treats are plentiful. The nice thing about doing happy hour by pedal power is the ability to bar-hop in a quick, easy and stress-free manner. And the really great thing is that you can always walk your bike if you want – pedaling while under the influence is not something you want to be doing in Key West. Only 55 miles from mainland Florida, the Bahamas have long been a source of cultural influence on Key West. The majority of Bahamians are descended from African slaves brought to the islands by British loyalists during and after the American War of Independence. By the late 19th century, many Bahamians were immigrating to Florida to work at fishing, sponging, and hunting sea turtles. These immigrants settled on the southwest edge of Key West town between Whitehead Street and the area that is now Truman annex. The neighborhood became known as Bahama Village for its distinctly Afro-Caribbean flavor, and the 16 blocks of modern Key West bordered by Fort, Louisa, Whitehead, and Southard streets still resonate with Caribbean cultural influences. Home of the Bahama Village Market, the area offers great restaurants, interesting shops, and fun walking tours. For a taste of old-time Key West, explore the narrow streets by golf cart, bike, or scooter and enjoy the rustic, pastel-painted houses with their small yards overflowing with lush tropical vegetation and quirky, artistic décor. If you are in town mid-October, be sure to catch the Bahama Village Goombay Festival, an island-style street party that features arts and crafts, Caribbean Junkanoos music along with reggae and other Afro-tropical styles, great food, costumes, street processions, and all-around family fun. When was the last time you were able to bike to a classical music concert? Go from flip-flops to refinement with an evening of performing arts at the San Carlos Institute. A Key West cultural landmark founded in 1871 by Cuban exiles as an educational, civic, and patriotic center, the Institute was central to the Cuban struggle for independence from Spanish colonial rule. Designed by Francisco Centurión, one of Cuba’s most prominent architects, the two-story building incorporates many traditional elements of Cuban architecture: spacious, high-ceilinged rooms, louvered windows, graceful arches, marble stairways, hand-crafted mosaics, and floors of checkered Cuban tile. The San Carlos has been lovingly and faithfully restored to its original beauty and decorated with many works of art depicting Cuban historical figures. Visited by thousands yearly and the venue for many important cultural events year-round, the San Carlos makes an evening or afternoon concert into something special for anyone who loves classical architecture and music. Did you know that Key West had a nature preserve? Don’t feel bad, no one else did either. Enjoy the unique experience of accessing a wilderness adventure by golf cart – just head down to the south end of White Street to the White Street Pier and Higgs Beach area, go left along Atlantic Boulevard, and look for a small gazebo and sign next to the 1800 Atlantic apartments’ parking lot. Or pull in when making your way between Smathers and Higgs beaches. The Berg Nature Preserve is a patch of rare undeveloped beachfront and mangrove forest that has been acquired by the City of Key West and preserved as an accessible natural area and beachfront. This slice of wilderness is a great spot for a walk and some moments of peace and quiet and is also home to plenty of birds, butterflies, lizards, land crabs, snakes, and frogs. The quarter-mile trail to the beach is a mini adventure trek, and the beach itself has a good length of walkable sand bounded by child-safe shallow water. A second entrance just to the west side of the apartments at 1700 Atlantic gives onto a boardwalk leading to an oceanfront viewing deck. It’s a good choice for those needing easier access, and the raised boardwalk offers nice views into the mangroves. The Five Brothers store is an old-style neighborhood grocery in a vintage building at Southard and Grinnell right in the heart of Key West. Five Brothers is the place to stop for lunch or snacks while exploring the old town neighborhoods by golf cart, scooter, or bike because using alternative transportation in this residential part of town makes it far easier to do photo stops or park to see the sights. This family-run shop is the place to get a real Cuban café con leche with a lunch plate or mixto sandwich. The Five Brothers lunch specials pull in a crowd ranging from Key West police and firemen, construction and utility crews, to retired millionaires and visiting celebrities. There are no tables, so grab a treat, pick up a bottle of wine, a Cuban cigar, and any sundries or souvenirs you need, then head for a picnic at the beach, on Mallory Square, down at the Key West Bight waterfront, or just right into the nearby historic cemetery. Key West is a town with plenty of creative flair, and that side of the island is readily visible in the décor of many of the homes, in the clothing styles, wildly decorated bikes, scooters, and cars you see on the streets, and in the way Key Westers throw themselves into the fun and festive side of life. It is truly an art town, with numerous galleries scattered through the neighborhoods and a busy schedule of gallery openings and happenings. The monthly art walk, the Walk on White, runs out of The Studios of Key West in the historic White Street Armory on the third Thursday of every month. Catch it if you can, but if your Key West visit does not coincide with Art Walk Thursday, you can have just as much fun and hit even more galleries by setting your own impromptu itinerary and going by scooter or bike. Duval Street and the environs of Old Town are home to over 20 galleries, including Art Gone Wild, the Island Arts Co-Op, the San Carlos Institute, the Wyland Gallery of Key West, and much more. Get on the Internet and a few minutes of searching combined with a bit of Google Maps work will generate enough easy-to-reach venues to fill several nice biking tours. Put in a few stops for libations and you have all the ingredients of a great time. Start your golf cart, bike, or scooter tour of Key West just a few doors north of Pirate Scooter Rentals at the corner of Fleming and Whitehead streets, where a simple roadside sign at 490 Whitehead Street draws visitors as one of the island’s most popular photo ops: Mile marker zero of US Highway 1. Running north from Key West to Fort Kent, Maine on the US – Canadian border, US 1 is the longest north-south road in the United States, stretching 2,369 miles along the east coast and connecting most of the major eastern cities. From Mile Zero at the southern end in Key West, it is 129 miles (208 km) to Miami, the southernmost city in the continental United States. The stretch from the mainland down the Florida Keys to Key West is known as the Overseas Highway. This highway was originally built on the bridges of the Overseas Railway developed by American industrialist and Standard Oil founder Henry M. Flagler as an extension that connected his Florida East Coast Railway to Miami, the Keys, and ports serving Cuba. The line’s many long open-water crossings made the Overseas Railway an engineering wonder of its time. The railway operated from 1912 to 1935, when the Labor Day Hurricane of 1935 destroyed large portions of it. Now the Overseas Highway, the southernmost leg of U.S. Highway 1, is comprised of 113 miles of roadway and 42 overseas bridges, including the famous Seven Mile Bridge, the longest segmental bridge in the world. A photo at the US 1 Mile 0 marker indicates that you have been to the literal end of the road, which in the case of Key West is where the fun begins!